As the digital marketing manager at Structube, Paul Barszcz has to align many different teams in order to successfully lead online marketing campaigns. 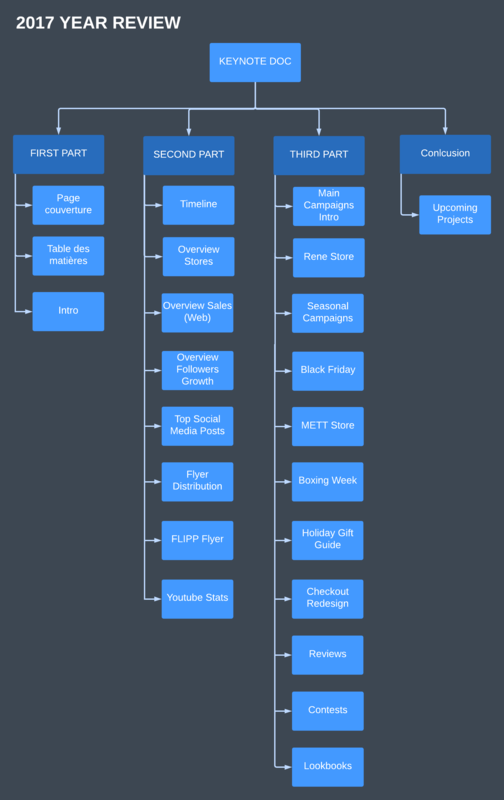 He has found that using Lucidchart visuals helps streamline communication and handoffs between teams, whether they're building Facebook ads and web pages or creating email marketing campaigns. Instead of making designers decipher his hand-drawn designs, Paul builds mockups in Lucidchart, which he can then pass on to his design and content teams for creation. Paul has to wear many different hats in a fast-paced environment, so time is precious. Lucidchart allows him to quickly create professional diagrams on the fly. Paul uses Lucidchart to make information more digestible. He simplifies dense reports by providing a visual outline in a diagram. Lucidchart serves as an archive that anyone at the company can reference. Paul can access old campaign drafts or reference previous mockups to get ideas for new campaigns. Structube is a specialty retailer of contemporary and modern home furnishings. Structube furnishings are handpicked in countries across the globe to offer customers exciting new products at low prices. “What’s wrong? It’s amazing,” Paul thought. But on second thought, even he had to admit it was a bit sloppy. And then he realized that having the team work from his scribbles probably wasn’t the most efficient method out there. But he needed some way to communicate his ideas across his team without spending too much time in meetings. Paul is the digital marketing manager at Structube, a specialty retailer of contemporary and modern home furniture and accessories that is based out of Montreal, Canada. His job is to lead the online marketing campaigns and to drive traffic to a brand recognized across Canada and the US. He works closely with the executive team to analyze marketing campaign needs and to coordinate the execution of strategies accordingly. This role includes managing relationships with agency partners, overseeing agency work, coordinating daily with the graphic/web design team, and ensuring projects roll out successfully. There are a lot of moving parts involved in these campaign rollouts, and Paul has to coordinate efforts across the marketing subteams—hence why he sometimes resorted to scribbles to convey his ideas. With those proving to be highly insufficient, Paul searched for other solutions. He considered Photoshop but didn’t want to purchase the expensive license. He looked into online wireframing tools, but they were too complex, too pricey, or lacked the right features. Finally, a graphic designer suggested Lucidchart. Almost immediately, Paul realized Lucidchart was what he had been looking for. Paul now uses Lucidchart to streamline communication and handoffs on many of his projects. Structube’s Facebook canvas ads have some of the best engagement rates the company sees in their online ads. However, they do require a great deal of planning and asset creation. Planning an ad starts in Lucidchart. 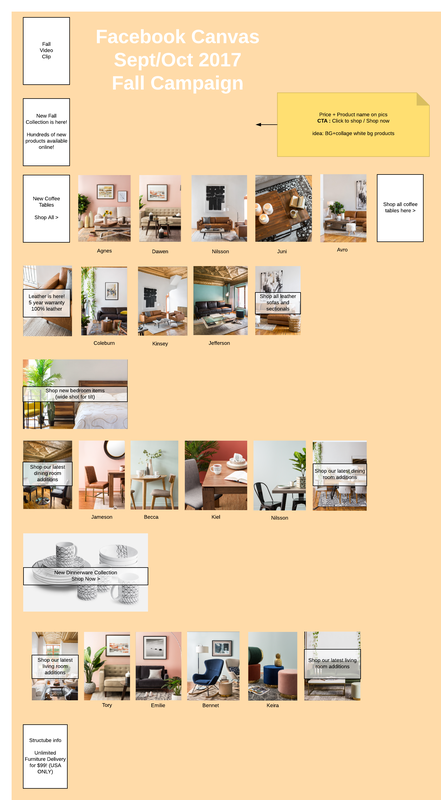 Paul fills a Lucidchart document with square text boxes and then pulls in the best product and decor shots for a given campaign, creating a rough mockup of the ad’s layout and what he’d like included. He then passes this visual onto his content and graphic design teams so they can create the specific assets, which can include cropping images, writing copy, editing a video, etc. They know exactly what is needed and don’t have to decipher hand-drawn images. Lucidchart also serves as an archive. Paul can easily access previous ads to gain inspiration when he starts a new campaign. Paul takes a similar approach when creating new web pages. He outlines the page in Lucidchart and passes it to the graphic designer who builds a mockup and then works with the web integrator to code it. Both are easily able to reference the Lucidchart doc throughout the project to ensure all necessary elements are built. According to Paul, one of the most useful campaigns for an e-commerce business is the welcome journey, which is the sequence of emails a customer receives after they’ve filled out a sign-up form on the website. The marketing team has been using emails that had been thrown together a couple years ago and were due for a major refresh. Paul turned to Lucidchart in order to get his ideas for these new emails out of his head and onto a screen where they could be shared with others. He built wireframes outlining what should be included in each email. He then shared the finished diagrams with his graphic design and content teams and set up a meeting to review them. These visuals served as a jumping-off point, equipping the teams with the bare bones so they could then take over the creative process. At the end of each year, the marketing team reviews all the campaigns they have completed. They create a 100-page report describing the details and results of each campaign. That’s a lot of information that can be hard to digest. That’s why Paul and the marketing team use Lucidchart to create an outline for this dense report. It’s a visual reference that quickly outlines all the campaigns in one view. “Using Lucidchart has allowed us to archive our campaign drafts, as opposed to using pen and paper, which gets lost,” Paul explains. Now that Paul has Lucidchart, he often thinks about how easy his life would have been if he’d found it earlier, like while earning his degree in electrical engineering. “I wish I had this back in college when I was working on assignments. This would have saved me so much time drawing rather than by hand or using software that I had to take screenshots of and later crop,” Paul explains. Lucidchart would have come in handy at Paul’s previous job, where he had to design floor plans for a new retail store location. He looked online for a tool that could help him but found they cost several thousand dollars. Instead he had to use Photoshop, which made editing his drafts a time-consuming and annoying ordeal. And the company as a whole appears to be enjoying the platform. “We’ve tried a lot of tools here at work. A lot of the tools we use for a while and then we drop them simply because we don't like the way they work. But we’ve used Lucidchart for over a year and we keep going back to it, so that means a lot for us. It’s a product that we are now using. If we didn’t like it, we wouldn’t be using it,” says Paul. The only people who may be more happy about Lucidchart than Paul himself? His graphic designers who no longer have to decipher his artwork. Ready to see how Lucidchart can streamline communication at your organization?